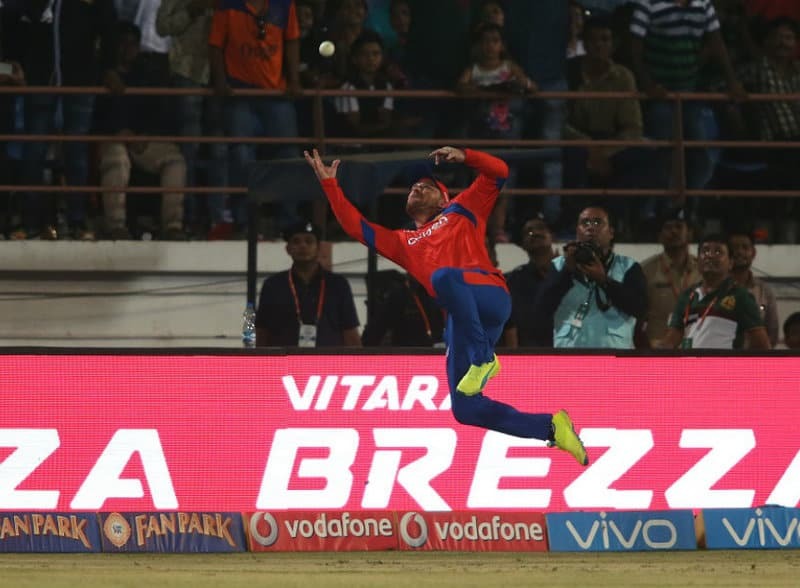 This Is Why Brendon McCullum Is Actually Superman Reborn..!! Watch The MindBoggling Save..!! The equation came down to eight required of three overs for Delhi Daredevils to clinch the match against a tedious looking Gujarat Lions. It was in these circumstances that highly talented Sanju Samson took the strike. And Immediately got to business, as he swept a Jadeja delivery over long on. It looked like the swipe had enough power to clear the boundary and seal the match for them. But then there was Brendon McCullum patrolling the long on boundary. And to pass him was not going to happen. That’s when McCullum got into his ‘thug life’ mode, and pulled off a stunt out of superhero movie. A foot inside the boundary, McCullum backtracked slowly with his eyes peeled on the trajectory of the ball. As it descended, McCullum leapt. With both feet in the air, he stuck out his right hand, and hung on. But then something spectacular happened. Just before meeting the ground – over the boundary – he threw the ball back into the field of play to save four runs. Hence proved Brendon McCullum can stop time. Hell Yeah..! !